Relocating to a new state can be attributed to several factors such as purchasing a new house, attending to old family members or seeking for greener pastures. Regardless of the reason, the next big question is when to start looking for a job when you are relocating. The first thing you need to do is to end your ties with your current employer. It would not help to keep them hanging, regarding your plans. Honesty is always the best policy. You might gain their support the endeavor you are about to take, like getting an endorsement letter. Maintain that positive atmosphere with your boss. Cite positive reasons why you are resigning from your current job. Avoid telling your boss that you are unsatisfied with your position. By doing this you are on the right track. Ideally, you need to have a stable income to fully support your needs, in your new home. Remember, relocating means starting your life again in a different state, having limited resources is the least you need. You don’t want to start on the wrong foot, do you? It is imperative to find possible employment first before relocating. Starting on a new home may give you extra expenses. If possible, start looking for a job, before relocating. 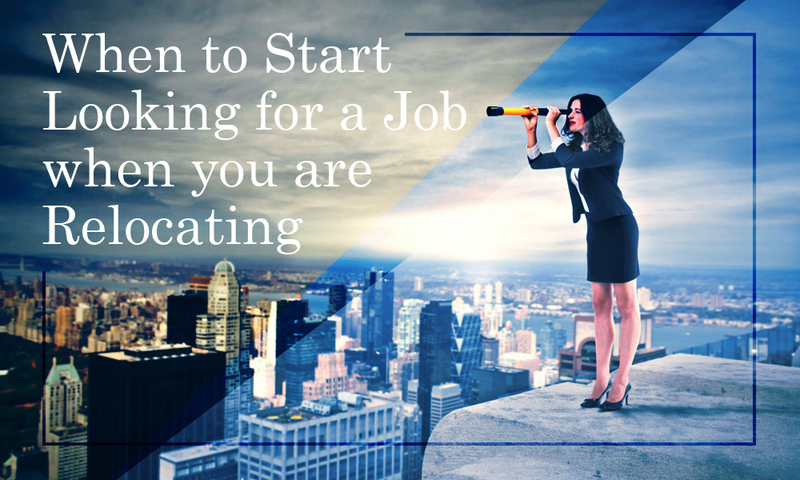 Here are some tips in finding your job prospects and easily working on that target employment. 1. Check your new home. Prior to your relocating date, visit your new home. Be familiar with your location. Look for nearby business areas, where you may look for possible job employment. Though you can browse on the net, it is still better to visit your future community. Familiarize yourself with the place and the industries present in the community. 2. Create A Budget. After identifying possible areas where you can seek employment, you should make a plan on how and when you should end your job hunting. Create a budget for your job hunting. Remember that you’re aiming to improve your source of money not to dry it up. Studies prove that it will take about an average of one month for a salary of $10,000.00 to $20,000.00 in desired annual income, to find a job. However, the length of time for you to find a job can be affected by these factors. 3. Prioritize industries you are most familiar with. Choose two or three industries you are most familiar or the most related, if not exactly the same as your previous jobs. 4. Prepare your resume. Knowing where to look for a job and possessing that attention catching resume goes hand in hand, in your success of getting employed. It would help a lot, if you write a resume highlighting your job experiences and your skills. Be guided that many staffing firms and companies use the ATS or Applicant Tracking System to process job applications and to manage the hiring process. If you are not familiar with how your resume, can pass through this system, you may want to try visiting some professional resume writing services. 5. Be flexible. Relocating is such a brave act. So, it is also necessary to prepare yourself for the challenges of job hunting. You may not easily find a job that suits your skills and prior job experiences. You may also want to put on that brave front and challenge your other competencies. Venture on a new job, which you think you can deliver. After all, learning is a never ending process. On the other hand, you might be in for a surprise – a job offer with a better compensation than your previous one. Good luck on your new ventures – relocating and job hunting! If you find it difficult to tell the story of your professional experience to a potential employer, ask a professional to do it for you. Our professional resume experts are ready to help you achieve your career goals. Please call our toll free (844) 993-3841 for more details on our services. This entry was posted in Career Management, Job Search Techniques, Recruiting, Resume and CV Writing. Bookmark the permalink.